by Amie Valpone Author · Mark Hyman Author of introduction, etc. After suffering for a decade from a range of ailments like Lyme Disease, Hypothyroidism, and Leaky Gut Syndrome, Amie Valpone, creator of TheHealthyApple.com, healed herself through clean eating and detoxing. 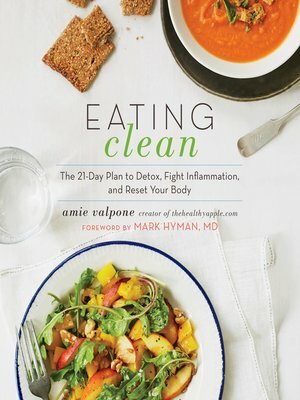 In Eating Clean, Amie provides guidance on how to fight inflammation and reset your body, including a 21-Day Elimination Diet, instructions for food reintroduction, a 2-week meal plan, and an extensive pantry list. The book has over 200 recipes that are vegetarian and free of gluten, dairy, soy, corn, eggs, and refined sugar to keep tummies healthy and satisfied—such as Velvety Pear and Fennel Soup, Carrot "Fettuccine" with Sun-Dried Tomatoes and Pumpkin Seeds, and Vanilla Bean Coconut Ice Cream. With this book, readers are able to get the support they need on their path toward wellness. AMIE VALPONE, HHC, AADP, and founder of TheHealthyApple.com, healed herself from a decade of chronic illness. Amie cooks for a variety of clients, including celebrities, using organic, anti-inflammatory foods to create recipes and meal plans.